DuraFast Label Company is pleased to offer high resolution color label printing products from Primera Technology to customers throughout Canada. Primera is a leading manufacturer known for its innovation and quality. 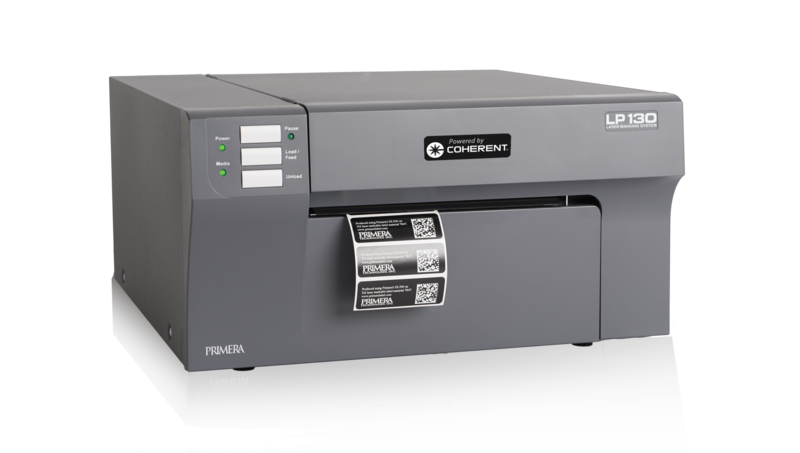 Primera makes a variety of color label printers for any number of applications including desktop label production, high volume digital color label production, RFID label printing, and laser marking. Visit our showroom in Toronto to see the following Primera color label printers in action! 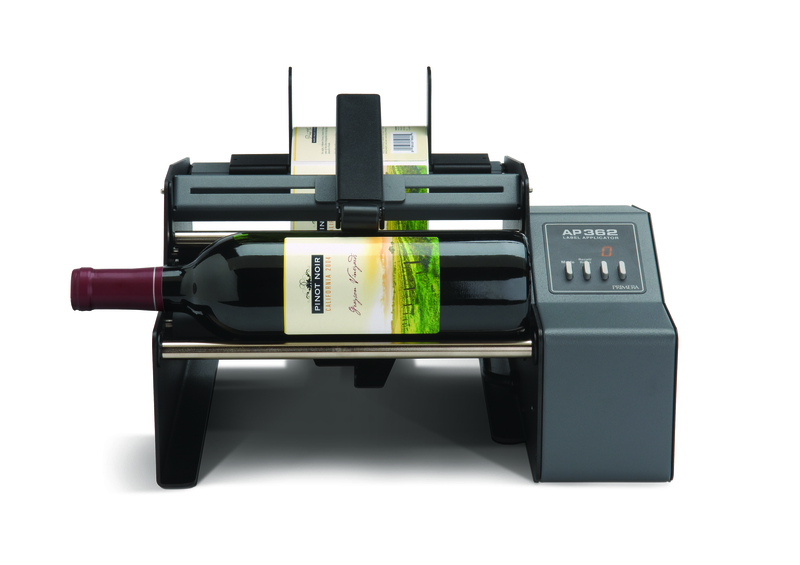 The Primera LX400 is a high-resolution 4800 dpi color inkjet label printer used for short-run specialty products such as wine and gourmet foods. 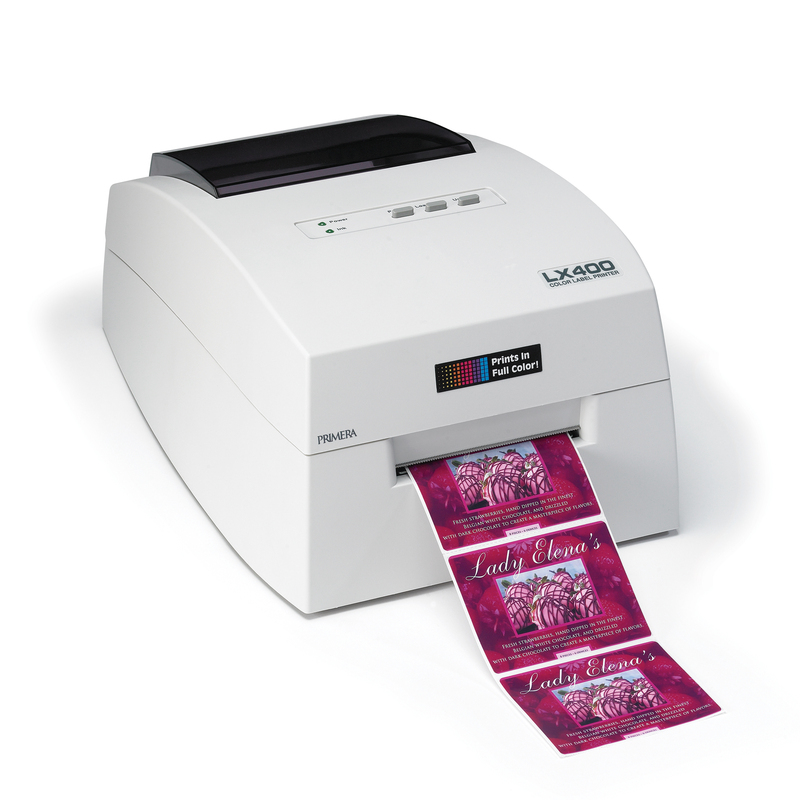 The Primera LX400 label printer prints directly onto a wide range of materials including high-gloss, matte, polypropylene and polyesters in a range of 0.75 to 4 inches wide and up to 17 inches long and is also ideal for printing box-end labels. Labels are printed in full color and the included BarTender UltraLite Primera Edition design software allows for the insertion of images, bar codes and text. The LX400 also comes packed with a color ink cartridge, a 4” x 3” roll of Tuff Coat high-gloss label stock, a USB 2.0 cable and instruction manual. The Primera LX900 is a high-resolution 4800 dpi color inkjet printer suitable for printing labels for a wide range of small goods. It's ideal for artisanal foods and beverages, gift baskets, oils, health and beauty products, pet foods and supplements among others. Color droplet size is the most precise available in a commercial inkjet printer (4 pl color and 5.5 pl black) and individual ink cartridges are used for cyan, magenta, yellow and black. The Primera LX900 prints onto a wide range of materials at up to 4.5” per second and at a maximum width of 8". 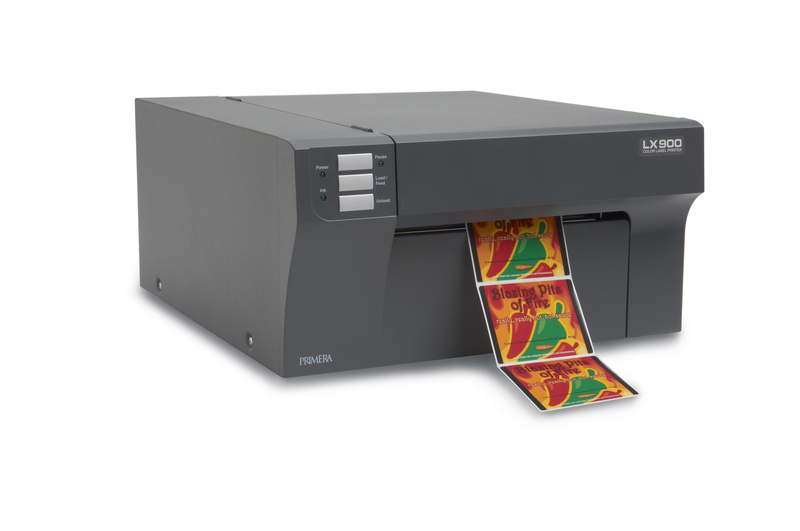 Several LX900 printers can be operated simultaneously from one PC if production needs require it. The Primera CX1000 is a high-quality 2400 dpi laser printer suitable for food, beverage, cosmetics, GHS (BS5609), supplements and private labels among other applications. It prints die-cut labels up to 500 feet (152.4 meters) at a time at a speed of 16.25 feet (5 meters) per minute. Cyan, magenta, yellow and black toner cartridges have their exact toner level monitored by a memory chip and can be replaced individually. The printing process is automated and enables the user to leave the printer unattended and come back to finished and cut labels. 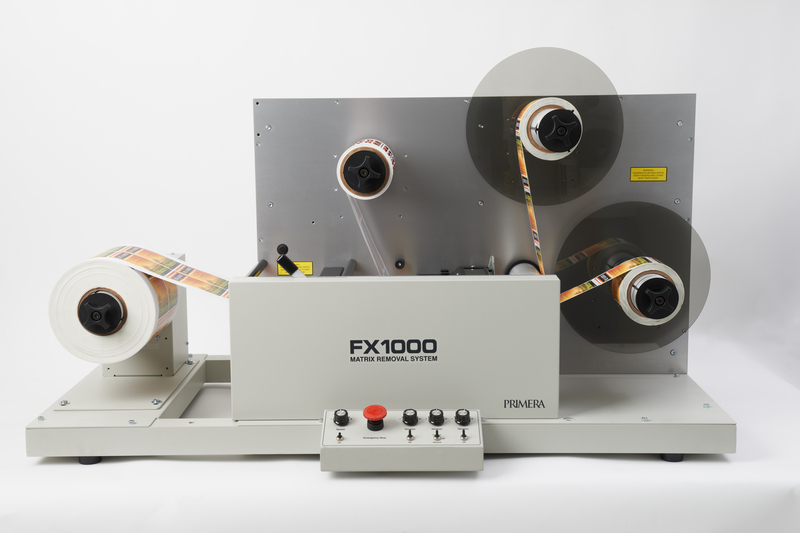 The CX1000 can also be fitted with the optional FX1000 Matrix Removal System which slits and rewinds labels to finished rolls while removing waste label matrix automatically. The Primera CX1200 Color Label Press prints full-color labels for short to mid-sized runs at a resolution of 1200 x 1200 dpi. Up to 1250 labels (the equivalent of a 12" diameter roll) can be printed at a time at a print speed of 16.25 feet per minute. The IntelliTorque control system monitors tension across the web and varies torque on the rewind mandrel dynamically to always produce the ideal roll. The Primera CX1200 laser label printer prints on a wide variety of high-gloss, semi-gloss and matte materials (including GHS and BS5609 compliant substrates) and comes equipped with four separate replaceable toner cartridges. 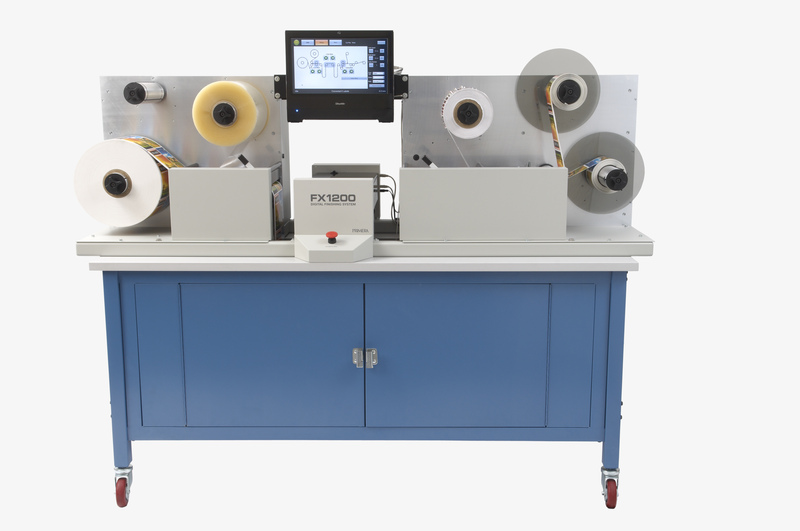 Primera’s FX1200 Digital Finishing System finished labels off-line in a single automated process at a rate of 20 feet (6.1 meters) per minute. An integrated touch-screen PC with a wide-screen color LCD is used to control process parameters. The FX1200 employs QuadraCut technology - four tungsten carbide steel knife blades for cutting instead of the traditional steel dies to reduce printing costs and increase throughput. Double dual-zone timing mark sensors ensure re-registration to pre-printed images is precise. Nearly any size or shape can be created from a wide range of substrates. Digitally cuts labels to any size or shape without dies. Laminates, slits and rewinds your unfinished labels, using the Primera FX1200. The perfect companion for the Primera CX1200 Color Label Press. The Primera PX450 is a compact point-of-sale printer designed for use at retail counters and for other applications where immediate issue is needed and space is at a premium. 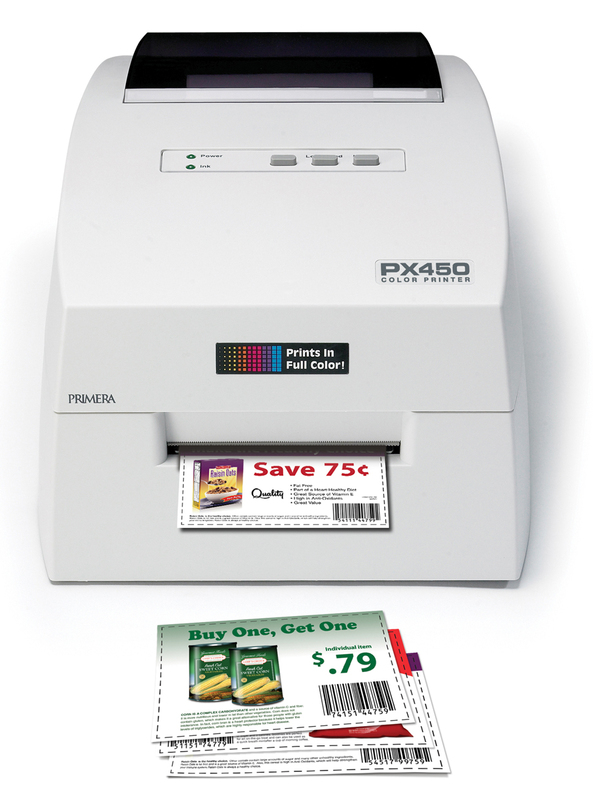 The PX450 accepts paper widths of 1" (25.4 millimeters) to 4.25" (108 millimeters) making it suitable for printing coupons, tickets, identification badges and receipts among other uses. A typical 4” x 2.5” (101mm x 63.5mm) print is produced in less than five seconds and cut precisely to specifications with the included guillotine cutter. The PX450 connects to POS systems and Windows devices via included USB cable. The unit also comes packed with one snap-in three-color ink cartridge and a label roll. The Primera RX900 prints and encodes pressure-sensitive radio frequency identification (RFID) labels and tags on demand. The built-in Intermec UHF reader/encoder module supports ISO 18000-6B, ISO 18000-6C and EPC Global Class 1 Gen 2. Labels can be printed in widths from 1" (25.4 millimeter) to 8" (216 millimeter) at speeds of up to 4.5" (114 millimeter) per second. Labels are printed one at a time with no overbleeding and in full color at a resolution of 4800 dpi to a wide range of substrates including polypropylene, water-resistant paper and polyester. Cyan, magenta, yellow and black ink cartridges can be replaced separately. The unit is compatible with Windows XP, Vista and 7. 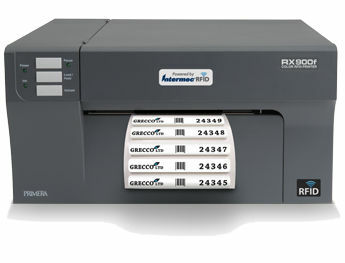 The Primera RX900F prints and encodes foam-backed radio frequency identification (RFID) labels and tags on demand. These tags are ideal for use on or near metals and liquids. Tags can be printed up to 5.5" (139.7 millimeters) wide and up to 1/8” (3.175 millimeters) thick at a speed of 4.5" (114 millimeters) per second. The RX900F prints either one at a time or in batches at a resolution of 4800 dpi to a wide range of substrates including polypropylene, water-resistant paper and polyester. The included Intermec UHF reader/encoder supports ISO 18000 -6B and -6C and EPC Global Class 1 Gen 2. Cyan, magenta, yellow and black ink cartridges can be replaced separately. The unit is compatible with Windows XP, Vista and 7. The LP130 is a laser marking system used for ablating or phase-changing of specialty label substrates and designed in a compact form factor for placement on a desktop or workbench. These labels are primarily designed to be replacements for etched metal plates or thermal-transfer laminated polyester bar code labels. Some examples of possible uses include automobile VIN plates, Department of Defense IUID labels, medical UDI labels, solar panel and harsh environment labels and tamper-proof security labels. Labels can be printed with smoke or smokeless substrates. If the substrate generates smoke and fumes while printing, the optional DF-30 filtration system must be installed to provide for safe use in office, warehouse and other indoor environments. 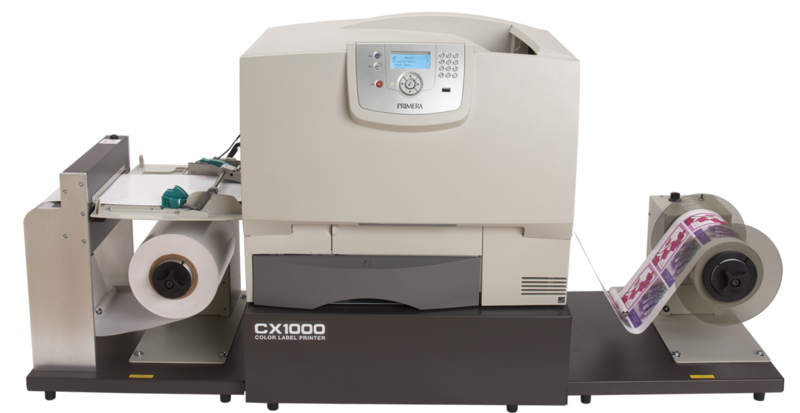 The Primera FX1000 Matrix Removal System from Primera Technology is the perfect companion to the Primera CX1000 Color Label Printer. This system provides you with simplified use of the printer by enabling you to remove waste label matric with ease. Printed labels can be wound into multiple rolls, and the one-inch slitting width for the liner enhances functional use of the printer. The removal system also boasts enhanced controls for functionality with an emergency stop switch, master speed, lower and upper rewind mandrel tension and more. 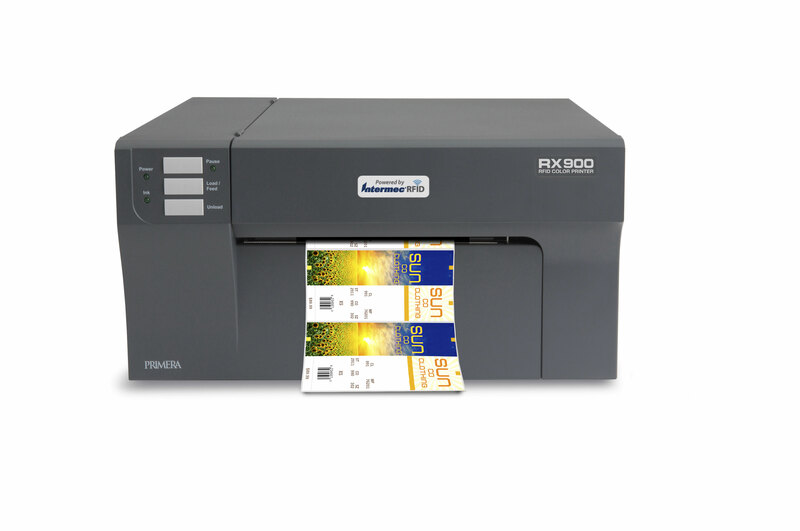 With a small footprint and superior functionality, the Primera FX1000 Matrix Removal from Primera Technology is the ideal accessory to use with your Primera CX1000 Color Label Printer. If you are looking for an easy way to maximize the function of your desktop label printer, look no further than the Primera RW-12 Label Rewinder from Primera Technology. This easy-to-use and fully functional label rewinder is designed to help you rewind large numbers of labels after completing a printing job, and it can be used with an inkjet, thermal or thermal transfer label printer. Its special design ensures perfect alignment and eliminates many common printer problems. It boasts special features such as a powder-coated steel cabinet and agency compliance. 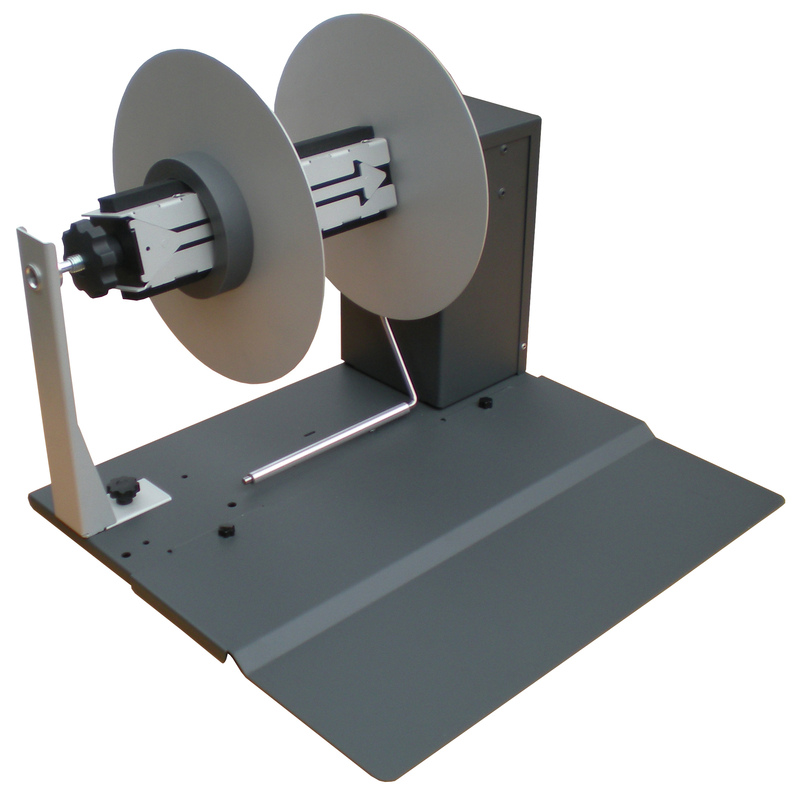 If you need to purchase a label rewinder for use with your label printer, the Primera RW-12 label rewinder from Primery Technology is the perfect solution. The Primera AP360 label applicator provides a semi-automatic solution for labeling cylindrical and tapered containers. It has a spring-loaded pressure arm that ensures labels are firmly applied without wrinkles. It applies single labels one after another to the front of the container. The spacing can be variable. It will label up to 1200 containers per hour and has a compact size to fit on a desk or counter top. 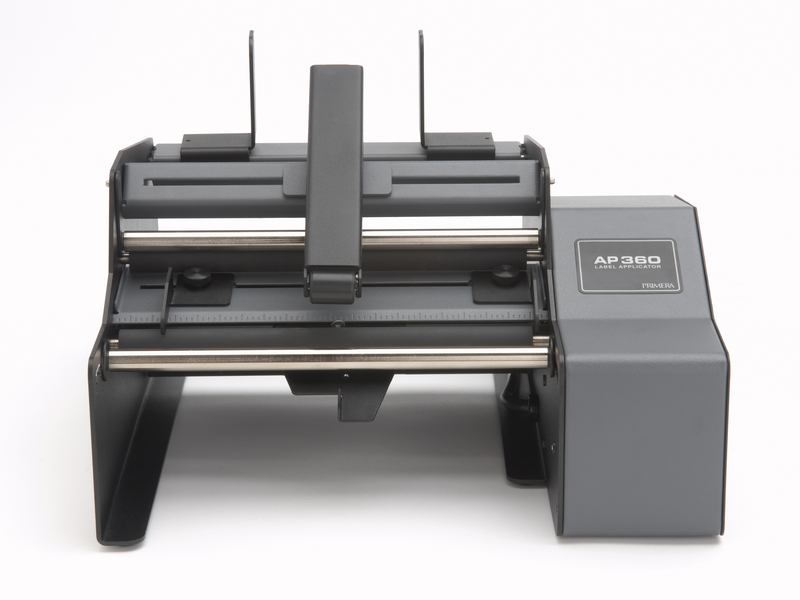 The AP360 was professionally designed and built with heavy-duty sheet metal and steel to last for years. It is one of few semi-automatic label applicators that is available with CSA, UL and FCC safety and emissions certifications. 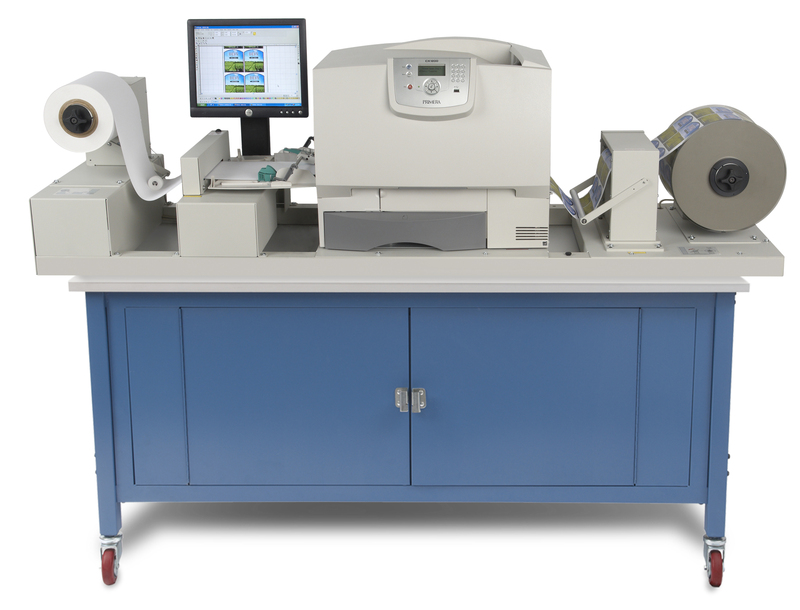 The Primera AP362 label applicator provides an advanced model of the Primera AP360 model. It has all the same features including the spring-loaded pressure arm, and will label up to 1200 containers per hour producing a professional-standard labeled bottle, jar, tube or can. The AP 362 can apply one or two different labels on a single container as well as on the front and back with variable spacing. Also included is a built-in LED memory and counter for up to nine front-to-back label jobs. It has a compact size and is manufactured with heavy-duty sheet metal and steel for long life. It also has the CSA, UL and FCC safety and emissions certifications. The Primera AP550 flat-surface label applicator provides an easy and quick way to apply product identification labels on a wide range of flat surface containers. Labels can be applied on boxes, bags, lids, tins, pouches, tapered or rectangular bottles and more. It is a semi-automatic applicator that will apply up to 500 labels per hour without wrinkles. The AP550 doesn’t require an air-pressure supply, which gives it a big advantage over other label applicators because there is no noisy, expensive and prone to maintenance air compressor. Rolls of printed labels of flexographic, thermal and offset transfer can also be applied. Labels can be adjusted to the most convenient position. It has a high-precision micro-switch activation system and also works with clear labels. It has an LED display with a counter as well as memory for up to nine jobs and a Universal Power Supply. 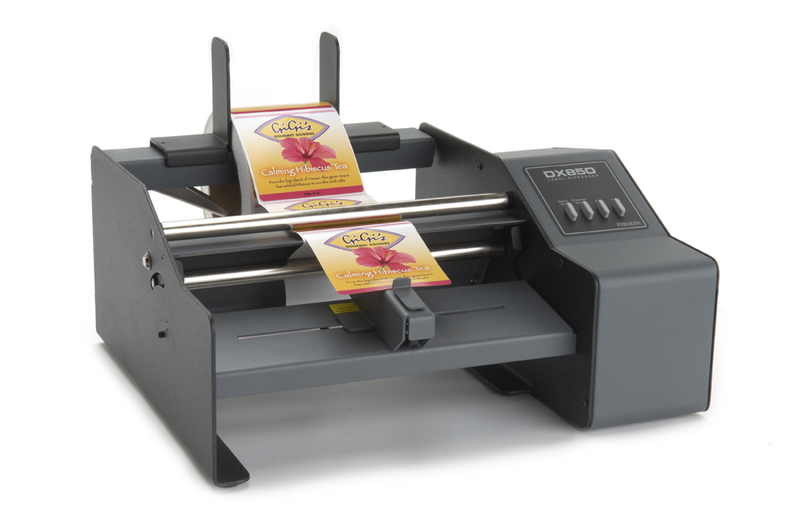 The Primera DX850 label dispenser provides a convenient way to peel and present labels from rolls. It has a built-in precision micro-switch that detects when the previous label has been removed from the dispenser so that a new one can appear. The built-in LED display counts the number of labels that have been applied or how any are left. The self-adhesive labels are automatically peeled, which increases the efficiency and speed of labeling. The dispenser is manufactured of heavy-duty sheet metal and machined steel and is UL, CE listings, UL-C, FCC approved and RoHS compliant. It has a full range of motion with no clamps or screws to adjust. It has a Universal Power Supply and the cord line can be changed to use with the power supply in any country.